OverVoltage The DC voltage is higher than 400V Possible cause is that the pump speed went down without resistence. The controller has to be send back to the Blue Eco service desk for further investigation. Low Voltage The DV voltage is lower than 230V Possible cause is that the incoming voltage inside the controller is too low. Try connecting the Blue Eco to another group. If the problem keeps occuring, the Blue Eco has to be send back tot the Blue Eco service desk for further investigation. OverOut Current The power supply to the pump suddenly is too high. Possible cause is a peak voltage to the controller. Turn the Blue Eco on and off. If the problem still occurs, the pump has to be send back to the Blue Eco service desk for further investgation. P 2 P Error There is a short circuit between 2 outgoing phases. Possible cause is dirt between the rotor and pump body. Take apart and celaning of the pump. If the problem still occurs the pump has to be send back to the Blue Eco service desk for further investigation. Data Error The data in the eeprom isn’t good. The controller has to be send back to the Blue Eco service desk for further investigation. CTU Error The power converter on the U phase is wrong. The controller has to be send back to the Blue Eco service desk for further investigation. CTV Error The power converter on the V phase is wrong. The controller has to be send back to the Blue Eco service desk for further investigation. CTW Error The power converter on the W phase is wrong. The controller has to be send back to the Blue Eco service desk for further investigation..
Power Supply ERR The incoming power isn’t good. Probier Sie die Pumpe auf einer anderen Sicherungsgruppe/ anderen Stromkreislauf anzuschließen. Sollte das Problem so nicht zu beheben sein, muss der Kontroller eingesendet werden. IPM Overheating The temprature in the controller is too high. The controller can’t get rid of its heat because the room where it is installed is too hot. Montieren Sie den Kontroller in einem kühleren Raum. Sollte das Problem so nicht zu beheben sein, muss der Kontroller eingesendet werden. – If the problem isn’t solved after cleaning, take your pump ot of the system and place it in a bassin to look if the pump then works. If this is the case, there is a blockage in the system. – If the problem keeps occuring, the Blue Eco has to be send back tot the Blue Eco service desk for further investigation. Cable Error There is a flaw in the cable. The pump has to be send back to the Blue Eco service desk for further investigation. Waiting The controller has to be send back to the Blue Eco service desk for further investigation. PFC Error The controller has to be send back to the Blue Eco service desk for further investigation. – As a result of a closed exit, the pump is running in its own water. ‘Solve the possible cause. If the problem keeps occuring, the pump + controller has to be send back to the Blue Eco service desk for further investigation. ‘- The impeller is broke or loose. – The rotor is loose of the ax. ‘The pump + controller has to be send back to the Blue Eco service desk for further investigation. Timer set Error Input is entered wrong while setting up the timer. The set up timer goes over the midnight hour (00:00). Reset the timer and make sure the timer doesn’t go over the midnight hour (00:00). The pump only runs to 1.200 RPM. The Blue Eco isn’t registered. Register the Blue Eco at www.blue-eco.nl and follow the Blue Eco startup instructions. The Blue Eco is registered. ‘- Make sure the serial number at the pump (at the foot or between the cool ribs) and controller (at the upside under the barcode) are registered in the right way. If this isn’t the case, please re-register the Blue Eco at www.blue-eco.nl. – Make sure the activation codes are entered correctly. If this isn’t the case, please re-enter them again if the pump isn’t running. 1. Turn on the controller and wait until “0” is in the display. 2. Press the “MENU” button until “SYSTEM” is in the display. 3. Press “ENTER” and then press 3 times at the yellow button with the 5 symbol. 4. “SERIAL NUMBER 1” shows up in the display. Write it down. 5. 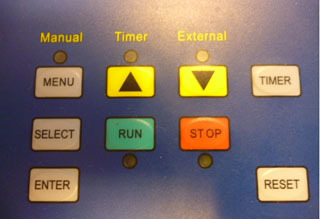 Again press the yellow button with the 5 symbol and write down “SERIAL NUMBER2”. 6. Press “MENU” twice to go back to the start display or wait for 30 seconds. If these 8 digits are noted, you have to contact the Blue Eco service desk and they will help you. I haven’t received an activation code. The e-mail with the activation code is maybe deliverd in the spam box. If this isn’t the case, you have to contact the Blue Eco service desk. The pump doesn’t give any water. Not all the valves are opened, so no water can reach the pump? Solve the possible cause by opening all the valves. – Take the pump out of the system and place it in the pond/bassin. If the pump is running normal, than it is possibly a blockage in the pipings. Get rid of the blockage. – Is the impeller running clockwise if when the pump is on? No, contact the Blue Eco service desk. – Remove the pump head of the pump and look if the impeller isn’t broke and is attached to the rotor. Is it broken or isn’t the impeller attached to the rotor? Send the Blue Eco pump back to the Blue Eco service desk. Isn’t the impeller broken and attached to the rotor? – Remove the rotor from the pump to look if the pump is dirty. If it is dirty clean it and place is back. Isn’t the problem solved, please contact the Blue Eco service desk. I’m using a Blue Eco already and would like to activate the timer function and dry running protection. You have to re-register the Blue Eco at www.blue-eco.nl. You will receive new activation codes. If you enter them you can use the timer and dry running protection. The dry running protection only works above 1.500 RPM. More information about the timerfunction can be found in the manual at this website.